Transport Canada will investigate whether seatbelts are necessary on school buses after a hidden report — recently made public — revealed buses failed the department's own safety tests. 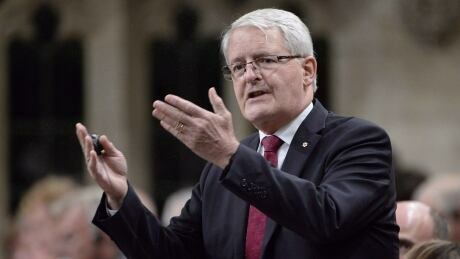 "I have instructed my department to take an in-depth look at the question of seatbelts in buses — a fresh look based on all of the evidence that has been collected since all the way back to 1984," said Transport Minister Marc Garneau in the House of Commons on Monday. A recent investigation by CBC's The Fifth Estate unveiled a 2010 Transport Canada report that found school buses "failed" safety tests and did not do enough to prevent "serious injuries." The study, which showed that high-backed, padded seats on school buses did nothing to help children in side-impact and rollover crashes, was marked "internal research report" and not posted on Transport Canada's website or otherwise made available to the public until CBC asked for it last month. In an interview, Suzanne Tylko, chief of Transport Canada's testing facilities, said she did not know why her report was not released publicly and that it was not her decision to make. The internal report shows the department ran a side-impact test on buses showed they "failed to contain" the dummies in their seats. The test results counter the opinion Transport Canada has held publicly since 1984 regarding seatbelts on school buses — that they could do more harm than good. Garneau said once his department makes a decision on possible additional safety measures, they will move quickly. "If we make the decision, for example, that we're going to put additional safety measures in place with respect to school buses we'll try to do it as quickly as possible, taking into account the fact that in some cases retrofitting or building them into new buses does take a little bit of time," he said in an interview. "We have to work, but the focus will be doing it as quickly as possible." With files from the CBC's Harvey Cashore.